Are you looking for teaching ideas for revising in writer’s workshop? This lesson is one of several posts on DARE to Revise (Delete, Add, Rearrange, Exchange) and will focus on R– for Rearranging! It is also in a series of writing mini lessons that scaffold through the writing process ideal for most writing curriculums. Rearranging is an important step to revising. Rearrange text so that it is logical and effective. Revisit the DARE anchor chart and tell students you will be focusing on the R- Rearrange. If one or more sentences are not in the right order, REARRANGE so that the paragraph makes sense! Move the sentence(s) to the correct spot in the paragraph. Model rearranging sentences in your class story. 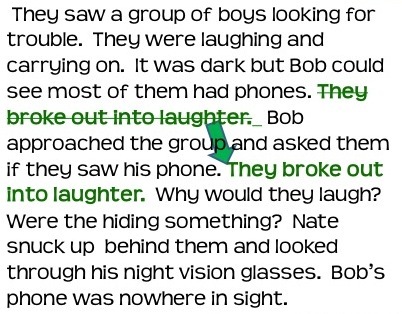 It makes more sense for the sequence of the story to have the boys break out in laughter after Bob asks them if they saw his phone. The story already said they were laughing. Now the story is taken to the next level when they laughed at his question. FYI- Later in the revision process, more words are changed to make it an even stronger paragraph. Students should apply this way of revising to their own writing. Are there things that should be rearrange to make it flow smoother or for the story to be in the right sequence and make sense? It might be a relevant detail but may need to go in a different section of the story! Have student partners or groups share places they rearranged. Sharing is important way to enhance student learning! I hope this helped you and your student(s) understand one more way to revise! NEXT LESSON: WRITING MINI LESSON#27- REVISING A NARRATIVE ESSAY- EXCHANGE!